Currently IN STOCK! Subject to change! Designed for large gardens, vegetable stands,and light commercial use. The Taylor Model 675 is excellent for black-eyed peas, crowders, lady fingers, white acres, and English peas. It can even handle mature butter beans. The easily adjustable rollers make it a snap shell peas or beans with equal ease. 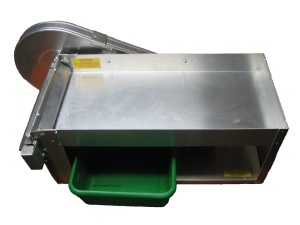 It is much larger and more heavy duty than other residential/ light commercial pea shellers. The top quality 1/3 HP motor powers scientifically designed rollers made from high tensile strength material. The rollers are easily adjustable to accommodate a wide variety of peas and bean hulling needs. It can shell 3-4 bushels per hour. I have found this claim to be quite realistic. Anyone who is serious about shelling can probably hull even more! It has the best hair and hand guards I have seen. The rollers are protected by guards in the front AND exit. Hands and hair cannot practically get caught in the rollers. The belt guard completely encloses the moving belt and drive wheels. All moving parts are protected against accidental contact. Just lay the unshelled peas or beans in the tray and slide them forward. 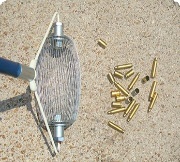 The beans drop down into the basket and the hulls are ejected out the front. It doesn't get any easier than that! In today's throw-away society it is nice to find something that is high quality and highly affordable. The Taylor Pea Sheller fits that description perfectly. It's built in America. I visit the plant regularly when I go to pick up my orders. These are good, down-home Americans that take Good Ol' Fashion American Pride in their workmanship. This machine is something that your grandchildren will pass on to their grandchildren! I get calls all the time from people asking me how to build a pea sheller. I ask them, "Why? The 675 is the PERFECT electric pea sheller machine. It shells purple hull peas just as gently as by hand but much faster and no sore thumbs. Homemade pea sheller machines are highly inefficient. People think they are saving money when in reality they are losing it because of all the mashed peas. People frequently ask me if these are new or re-manufactured pea shellers. They are NEW. I buy in very large volume and pick them up at the plant weekly during pea shelling season. I buy more in a good week than the 2nd largest dealer buys in a year! So I get volume discounts and it costs me next to nothing to bring them to my warehouse. No added shipping costs means savings to you! Please see our excellent Pea Sheller Review. We are the only dealer that carries the entire line of Taylor pea sheller parts. We have long hours of operation. Everyone else is M-F 9-5. You need help when you're shelling, that's why we're available nights and weekends. We actually use each sheller we sell. We have used a sheller for years and can't find parts now. 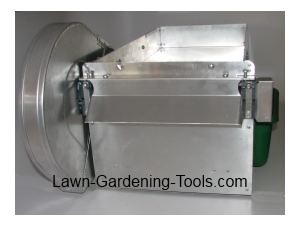 We ordered a new Little Sheller from Lawn-Gardening-Tools. This sheller can process a bushel of purpel hull peas in 20 minutes or less. The order from Lawn-Gardening-Tools I recieved was a serverly damaged sheller ( crushed by UPS). I contacted Lawn-Gardening-Tools and Kerry had the damaged sheller picked up and a new perfect sheller delivered to my door in 4 business days. You will not find better service than Kerry at Lawn-Gardening-Tools!!!! We finally got our pea Sheller!! We are very pleased. After picking a couple of bussells of peas with our new Pea pickin bag it was a blessing to use our pea Sheller. Thank you for keeping us informed. Wanted and ordered the "Mini" Pea Sheller but had to give in and upgrade to the regular Pea Sheller because the new Mini was not ready for shipping. My hubby was picking peas & we were tired of all the shelling we were doing by hand. It arrived overnight by UPS and my husband called and said he just didn't think it was going to work out (my heart sank for a moment)because it took 10 minutes to shell a 5 gallon bucket of peas! It took a minute for me to realize he was being funny cause 10 minutes vs 3 hours of shelling was awesome!. We are very pleased. The sheller is very quiet, does not make a big mess and is a huge help. I'm hiding it from family & neighbors!! The service was great you were very helpful. Cons: The bottom plate was slightly dented. I had to hammer it out. Works fine. Ordered it Tuesday and got it Wednesday. It took me about 30 minutes to put it together. It was mashing my butter beans so I called. They had me change the rollers a tad. Thanks! Good product with excellent service.very knowledgeable about product.Kerry did exactly what he said.That is hard to find now days. I would recomend this company and product to anyone. This is the second Tayor pea sheller in my family. The first one is passed around being used so much,( not sure how old it is, but hubby's said his granddad bought it when he was a kid and it still works like it is new)I thought I had to have one of my own. And I can't say enuff about the service I got on phone with a great guy that helped me getting it. I bought it late Monday and had sitting on my porch Tuesday when I got home from work. It can't get any better than that! Thanks!!! Pros: Great Product, Great Service! First Kerry is a Yankee and he can't hide it. I told him I only buy from Americans! After that we became good friends. From the opening conversation he put me at ease that he knew what he was talking about. He could probably teach the makers some things. The Little Pea Sheller was exactly what I needed and his little tips were a tremendous help. The best pea sheller in the world is southern made but the best salesman is a darn carpetbagger! If you call Kerry make sure you have your credit card ready because he's going to sell you something. I'm telling you that right now. Great customer service!! I placed my order by phone after asking many questions, and promptly received email notification of the order followed by another email notifying me of shipment later in the day. I received the shipment one day earlier than expected, but unfortunately the product was damaged. I called Kerry and he requested some photos of the damage. He called me back within minutes and sent me out another unit the very next day. Great guy to deal with and he went above and beyond good customer service. He also arranged pick up of the damaged unit (at no cost to me). I am extremely happy with the Taylor pea sheller. The gentleman on the phone spent a good deal of time with me. He was very knowledgeable. The Little Pea Sheller is perfect for what we do. It gets the job done fast and is over built. The last pea sheller I'll ever buy. Love this sheller!!! I have to also commend the seller for quick shipping and reasonable price!! We have been wanting to purchase this sheller for a long time and glad that we finally did. Customer service was great! I was scared to order from here because the price was so low you get what you paid for. I called 2 other places and they told me it would take 2 or 3 weeks to ship it I needed it now and this place said they had them in stock. The guy on the phone scared me even more because he was to nice he said he had a bunch of them and would get me tracking number so I could follow it to my door in about an hour I had a tracking number but I couldn't sleep. $450 may not be a lot of money to you buy it is to me so I got up at 2 and UPS said it was in Montgomary. The next morning it was in Nasville and the next day I got it. I called the guy up to tell him how scared I was and he laughed he was happer to see I got my little pea sheller than I am he even gave me a corn cutter which I hang up so I can tell people to buy from here. If you need a pea sheller buy it from here.